The YZF-R1 family brings MotoGP styling and performance normally only experienced by the privileged few to the streets for consumption by the “everyman.” Blessed with DNA from the purpose-built YZR-M1 (Mission One) racebike, the R1 range comes with varying levels of race-tastic features, though all three siblings could be considered as racy as one could possibly need outside a closed-circuit course. An on-board gyro enables a number of digital rider aids, such as the bank-sensitive traction control, slide control, ABS and more. Yamaha used its four-cylinder, Crossplane Concept engine to power the R1 family, the same mill as the FZ-10/MT-10, just in a more track-oriented package. 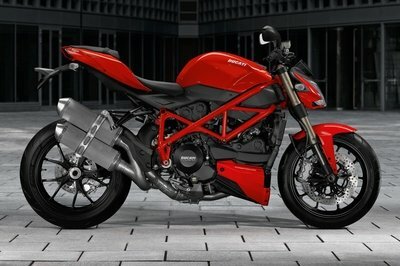 Sales in recent years have begun to shift away from the supersports as buyers began to favor naked/streetfighter bikes, and this M1-based trifecta represents a significant push into a waning market. Are they trying to reinvigorate the class, or just trying to grab what is left of that slice of the market? Time will tell, meanwhile let’s check out what Yamaha did to bait the table. 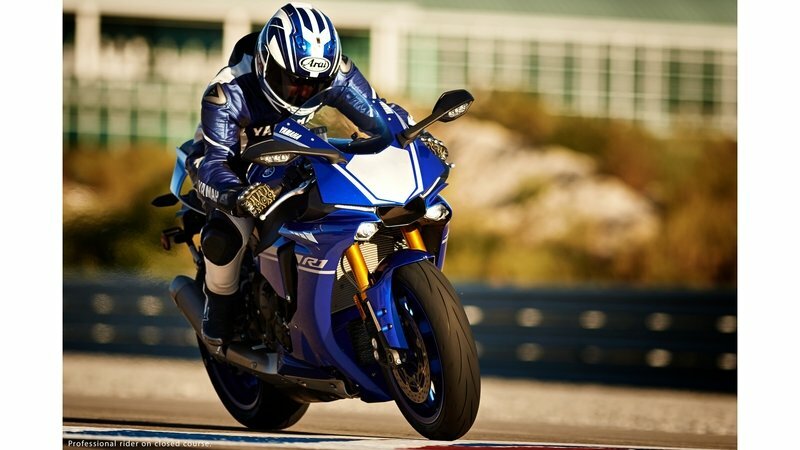 Continue reading for my review of the Yamaha YZF-R1, YZF-R1S, and YZF- R1M. Much like the M1, the R1 sports a windtunnel-tested fairing designed for maximum penetration; in fact the two are almost identical from the windscreen and scoop-shaped entry on back, but the trailing edge of the cowling is somewhat abbreviated on the R1 siblings, leaving us with just a glimpse of the beating heart that lurks beneath the cowling. No doubt about it, this is a family of straight-up, MotoGP race replicas, and the only real visual evidence of its intended use as a streetbike come from the mirrors, lights and license plate holder. Seat height is just a hair below 34-inches tall, and the handlebar and footrest placement pulls the rider into a very aggressive, forward-leaning riding position. Make no mistake, this is no regular around town commuter; it is set up to be as race-tastic as possible while remaining street legal, and so considerations such as comfort over a long haul or in stop-and-go traffic are not exactly front-burner issues. 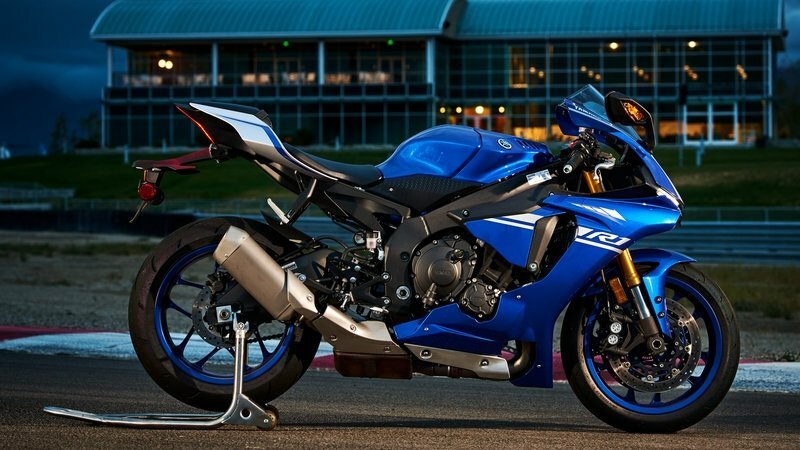 But honestly, if you think you need an R1 or one one of its variants, you probably aren’t looking for a grocery-getter, now are you? To be fair, the “S” is set up as the more street-friendly of the three, relatively speaking, but the base R1 and the “M” come ready for the track. Yamaha originally designed the Deltabox frame for the M1 in an attempt to retain the handling characteristics of the previous generation frame. As a stressed-engine unit, the frame uses the engine as a structural member, a move that removes weight and according to the factory, improves handling. The steering stem is set for 24 degrees of rake with 4 inches of trail, fairly common numbers for this type of bike that strike a balance between cornering behavior, and stability at speed. Yamaha shortened the previous generation’s wheelbase by 10 mm for a total length of 55.3 inches, and the boomerang-shaped, dual-side swingarm makes up 40.5 percent of that length. Cast magnesium rims mount the 17-inch tires across the range, but while the R1 and R1S roll on a 120/70 front and 190/55 rear hoop, the R1M upgrades to a 200/55 in back. Brakes are uniform across the range with a pair of powerful, four-pot, opposed-piston, ADVICS calipers pinching massive, 320 mm front brake discs. Rear disc diameter is a bit smaller at 220 mm, and the caliper falls under the management of Yamaha’s Unified Brake System (UBS). The UBS applies pressure at the rear caliper whenever the front brake is actuated, and the balanced braking is supposed to prevent adverse behavior of the rear end when using the front brake at speed. Input from the 3-D, six-axis, Inertial Measurement Unit (IMU) allows the UBS and ABS to deliver the appropriate amount of braking, even in variable situations such as trail-braking into a decreasing-radius turn. That same gyro also enables the use of the dynamic Öhlins Electronic Racing Suspension that factors in speed, lean angle and acceleration/deceleration to automatically adjust the suspension and dial itself in on the fly. Naturally, the engine is packed with race-tested technology and electronic wizardry, with a whole fistful of acronyms to decipher. First off, the mechanics of the thing. The R1 family runs Yamaha’s oversquare, 998 cc, four-cylinder, crossplane concept mill with a 79 mm bore, 50.9 mm stroke and 13-to-1 compression ratio. This is a 1 mm larger diameter and 1.1 mm shorter stroke than the previous generation, and a slight bump in compression up from 12.7-to-1, all of which leaves us with a little more horsepower and a skosh less torque this year. The R1 mill cranks out 82.9 pounds of grunt at 11,500 RPM backed up by a solid 200 ponies at 13,500 RPM, and I would point out that this is on the dyno where the ram-air effect doesn’t come into play, so you can bet the actual numbers at speed are even higher once the engine starts gulping pressurized air from the bow wave. Much like the mystery surrounding the number of licks required to reach the Tootsie Roll center of a Tootsie Pop, the world may never know exactly how much power this mill puts out at WOT. Now for some pure-frikkin’-magic (PFM). A ride-by-wire throttle and the six-axis IMU act as root systems for a number of nifty features across the range. A new Power Mode (PWR) function replaces the old D-mode for variable throttle-response curves in relation to grip position, and a lean angle sensitive, Traction Control System (TCS) intervenes to prevent loss of traction on acceleration and in corners. The Launch Control System (LCS) limits engine revs to 10,000 RPM regardless of throttle position for controlled race starts, and a Lift Control (LIF) works to prevent moonshots and keep the front wheel where it does the most good, in contact with the road. 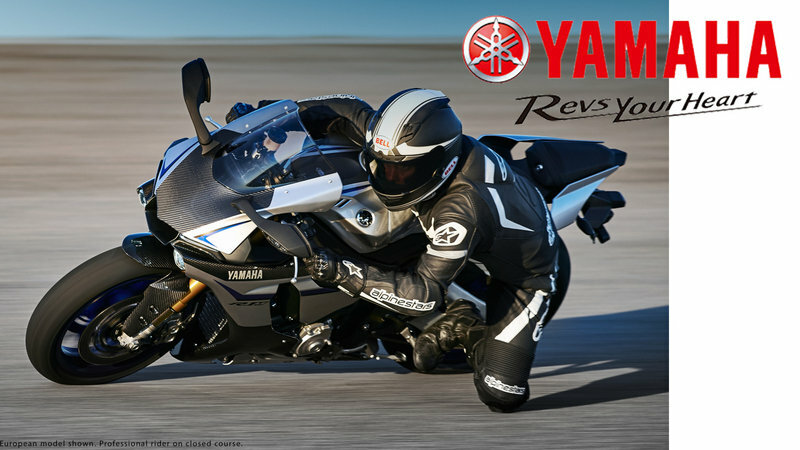 All of these features fall under the Yamaha Ride Control umbrella, and are present across the board on all three models. The race-tastic base R1 and “M” models come with a few extra benefits that the “S” leaves on the table. An adjustable Quick Shift System (QSS) kills the spark at the crucial moment for clutchless upshifts, and a Slide Control System (SCS) that intervenes based on wheel speed, lean angle and setting to prevent loss of traction in aggressive turns. Available only on the “M” is the Communications Control Unit that uses GPS and Wi-Fi to record lap data for download, review and analysis. Like I said, PFM o’plenty. A slipper clutch couples engine power to the six-speed, stacked-shaft transmission, and an O-ring chain makes the final connection to the rear wheel on all models. Prices across the range naturally reflect the varying levels of features. 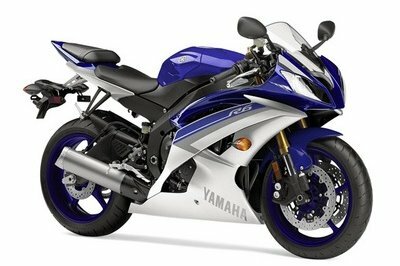 At the bottom we have the YZF-R1S in Cerulean Silver/Rave for $14,999. In the middle is the R1 in Raven or Team Yamaha Blue for $16,499. Top slot goes to the YZF-R1M in Carbon Fiber Liquid Metal at $22,499, which is still not a bad price for a street-legal, liter superbike. 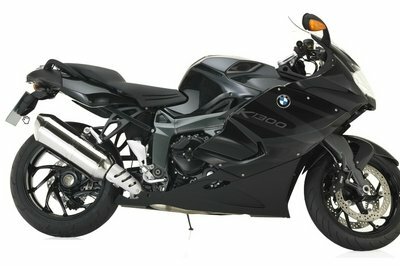 There aren’t but a handful of street-legal production bikes like this in the world, and since the YZF-R1M represents Yamaha’s top-of-the-line contribution to the supersport sector, I decided to go with a top-of-the-line model from one of the heaviest of European heavies; the BMW S 1000 RR with all available bells and whistles tacked on. Let’s see how it does. Looks are hardly work mentioning here. These bikes are all about performance, and both are very much form-follows function machines with little consideration paid to frivolous vanity. Well that’s not entirely true, the carbon fiber panels on the “M” serve as a high-tech, low-weight vanity pieces of sorts, at least if you are into that sort of thing. Personally, I like CF touches a lot. 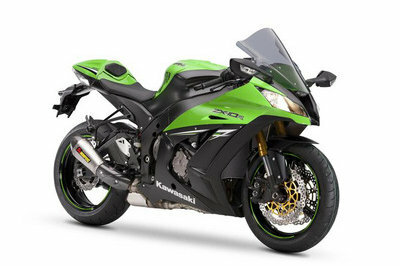 Suspension is more or less a wash with both bikes sporting inverted front forks and monoshocks under dynamic, automatic adjustment with 4.7 inches of travel across the board. 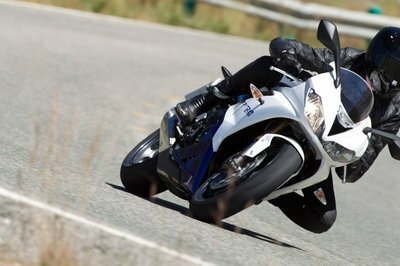 Both also sport race-oriented ABS systems, but the R1M alone offers a UBS feature. Slight advantage to Yamaha. Engines are neck and neck in the displacement category, with the R1 surrendering just a single cube to the 999 cc Beemer mill. Both run water-cooled, in-line, four-cylinder engines with four-valve heads, and both run ride-by-wire throttles with an alphabet soup of engine-management acronyms on board. 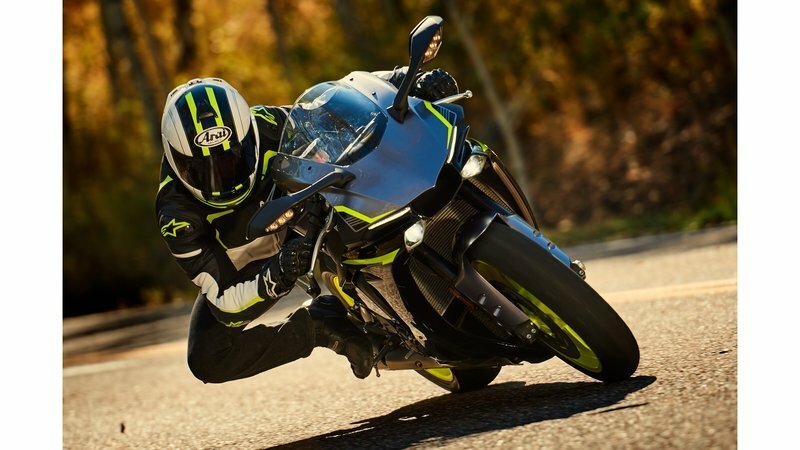 Rider modes, assisted shifts and traction control are consistent across the board, though the R1M does seem to offer a little more flexibility in the tuning department. 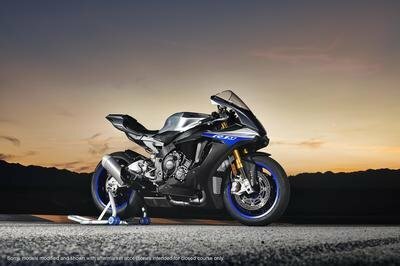 Differences in the performance numbers are also negligible with Yamaha turning in 200 ponies and 82.9 pounds versus 199 ponies and 83 pounds of grunt from BMW. The takeaway here is; these are both stupidfast bikes, and one horsepower here or a fraction of one pound-foot of torque there will not make much difference in a contest between the two, it will come down to skill. So far the Tuning Fork Company has made a pretty good showing, and these two bikes are in a dead heat with Yamaha ahead by a nose. Too bad it falls behind right at the last turn, way behind. 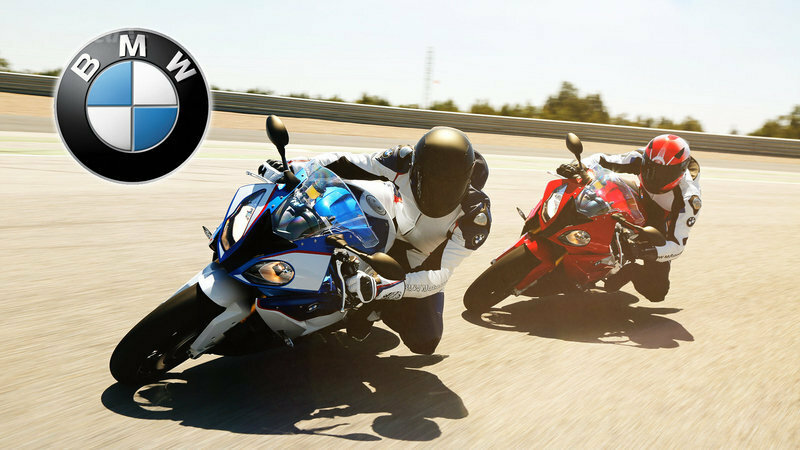 The YZF-R1M rolls for $22,499, not a bad price for the level of technology and performance you get with it, but the BMW S 1000 RR can be had for only $18,845. That’s enough of a difference to buy Beemer some business, to be sure.